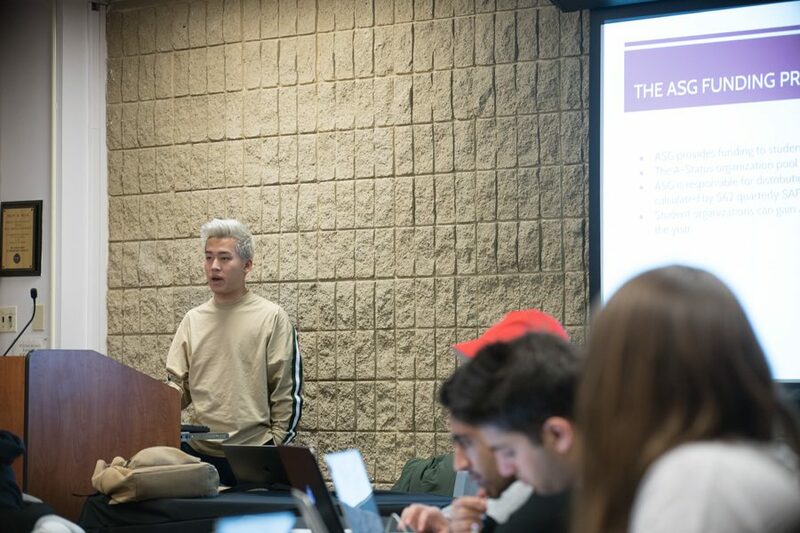 Weinberg senior Daniel Wu, the vice president for A-status finances, presents committee recommendations for fall supplemental funding. Senators will vote on funding next week. To ensure accountability for sexual misconduct, Associated Student Government members underwent their first Student Conduct Records Check on Wednesday — a quarterly process following a code change last year. ASG’s adviser will review records to see if members have been found responsible for sexual assault or misconduct. Chief of staff Lars Benson said members will not be automatically removed if they have been found responsible, but they will have a conversation with the ASG adviser. The Weinberg senior added that only the adviser will review the records. “In light of really widespread campus concern last academic year about sexual assault and misconduct, ASG stood forward and we kind of took this commitment where student groups should ensure that their members are not predators or guilty of sexual assault or misconduct,” Benson said. The code change, passed in March, mandates any ASG member found responsible by the University for sexual misconduct or assault to resign from their position. Senators passed the code change following a report of alleged druggings and sexual assault at Sigma Alpha Epsilon fraternity last winter. After an investigation, the University announced in March it would not pursue disciplinary action. Speaker of the Senate Daniella Lumpkin told The Daily the code change complies with Northwestern policy because no student can be involved in a student group if he or she has been found guilty of sexual misconduct. She added that the policy ensures a safer community for ASG members. Later in the meeting, members proposed A-status supplemental funding. Vice president for A-status finances Daniel Wu said the committee recommended the allotment of more money because it had a surplus. The Weinberg senior also presented changes to ASG funding for events. Student groups can now request 40 percent total funding for a new event. Previously, they needed to host an event without ASG assistance before receiving funding, Wu said. Additionally, if a group has organized an event at least once without ASG assistance, the committee will consider funding the event completely, Wu said. The committee recommended allotting $123,050 to Mayfest and $43,170 to A&O Productions. Senators will vote on funding next week.